The above statistic shows the number of internet users in the Asia Pacific region as of January 2019. As of that month, China had 802 million internet users. Second-ranked India accounted for 560 million internet users. As of June 2014, in a distribution of internet users worldwide, the Asia Pacific region accounted for 44 percent of all internet users aged 15 and above. Asia Pacific’s share at that time was more than Europe and North America combined, which reveals its dominant position in the market. Despite accounting for a majority share of internet users worldwide, the industry still has room for growth in Asia Pacific. Internet user penetration in the region was recorded in 2013 with forecasts generated for the years up until 2018. In 2013, 30.9 percent of the population had accessed the internet via any device, at least once a month. By 2018, the share of the population is expected to grow to 40.7 percent. When it comes to the demographic of Asia Pacific’s internet users, the distribution as of June 2014, by age group, may be of interest. In a survey of users aged 15 or over, who used the internet in either home or work locations revealed that 30.4 percent of internet users were aged between 35 and 34 years old. This share was slightly more than those aged between 15 and 24 who accounted for 29.4 percent of all internet users. Mobile internet is an area of the internet industry which has undergone development across the globe in recent years and Asia Pacific is no exception. The growth of mobile phone internet usage can be determined by the internet user penetration in Asia Pacific in 2012 and 2013 with a forecast provided until the year 2018. In 2012, 22.4 percent of the population accessed the internet via a mobile browser or an installed app. A year later, this figure grew to 25.9 percent of the populations and is expected to grow on a yearly basis, until at least 2018. 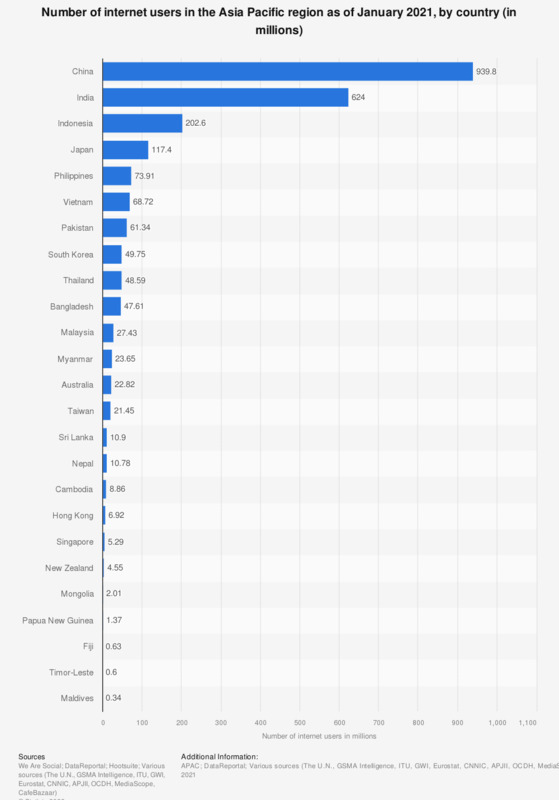 Data found from various country reports in the Digital in 2019 reports.